I admit, framing bandleader Malcom Catto and his fellow musicians merely as a jazz-funk ensemble isn’t the greatest choice to make because there is more about The Heliocentrics than that, much more. It’s true the Londoners combine funk, jazz and beats but they also bring in ethnic elements to their music. Under influence of respectively Mulatu Astatke, Orlando Julius and Lloyd Miller the collective does not shun to mingle Ethio-jazz, Highlife, Persian, Afghan and Far Eastern music to their already vague semi-groove. The Heliocentrics therefore hard the pin down as they made dipping into the eclecticness an art form in the past 10 years or so. From The Deep is a 19-tracker on which most pieces never hit the 3 minute mark. From this point of view you could approach the album as a set of incoherent excerpts. It is however the whole feel of the album that counts. In essence the collective sets of to do a deep reconnaissance within all that lies between the scheme’s of free funk jazz and ethnic psychedelics. With the obviously titled ‘Discovery’ the reconnaissance starts on a positive tone, with some watery guitars and fluid drum patterns that reminds DJ Shadow’s sampling galore from back in the day, but without the jazz. Here, as the track progresses, post-bop and fusion influences are brought in to stir things up. Apart from the more or less jazzy side of things, From The Deep also offers a suspenseful cinematic score at times. Sets of short tracks, let’s say: ‘The Five Thing’, ‘Thunder & Lightning’ and ‘Noises and Conversations’ are hallucinating tension builders. In full looseness, a vibraphone, Middle Eastern harps and steadfast drums and so on flow into and over each other and could easily accompany a scary scene in a 60s sci-fi movie. On the few tracks that do surpass the 3 minutes, like ‘The Pit’, ‘Night and Day’ and ‘Looking Back’, the collective relentlessly breaks free from all conventions. On the ‘The Pit’ the lads kick in a shrill saxophone, furious vibraphone and a light mysterious synth to set up one of the most exciting grooves I’ve heard in years. ‘Night and Day’s’ string section, distorted electronica and bass interplay is more toned down which gives it a more ‘eyes on the horizon’ feel whilst ‘Looking Back’ turns the spotlight on free jazz again. Here, the build up from some wicked jazz drumming combined with ringing bells strangely evolves into some intense swirling sax play. Catto et al also honour the earlier collaborations with Mulatu Astatke and Lloyd Miller. ‘Visions of Himself’, ‘Something Bad a Coming’, ‘The Five Thing’ and ‘Into The Vortex’ have clear Ethio-jazz and Persian signatures but are smartly derailed so doesn’t leads away the attention too much. In terms of sound design you could say The Heliocentrics definitely found their niche by bringing together all experience they have gathered around them in recent years. From The Deep still is raw and conceptually challenging but moreover, is far more accessible than the dark settings of 13 Degrees of Reality and The Last Transmission. 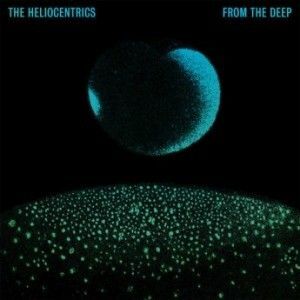 With this latest The Heliocentrics reaffirm their status as a collective that is able to inexhaustible turning themselves inside out and gives us something to keep discovering over and over again. This entry was posted in WRM and tagged 13 Degrees of Reality, 2016, Afghan, Beats, cd, DJ Shadow, Ethio-jazz, Ethnic fusion, Far Eastern, free jazz, From The Deep, Highlife, Jazz-Funk, Lloyd Miller, Malcom Catto, Mulatu Astatke, Now-Again Records, Orlando Julius, Persian, post bop, review, sci-fi, The Heliocentrics, The Last Transmission. Bookmark the permalink.